I've thought a lot about this lately and finally came to the decision to leave SBS-13. Hubby and I are soon to adopt 2 boys and will really have our hands full. I'm not sure that I'll even be able to keep up with my blog, much less visit others and leave comments. Thanks so much to everybody in the group - I will still try to visit your blogs when I can! 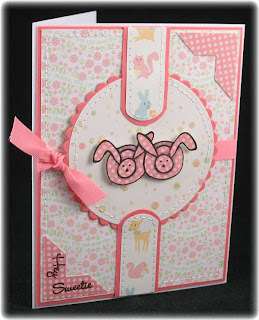 Today's card was made for 2 different challenges: the Amy R. Friday Sketch #26 and the Verve Stamps August Project Parade which is to use pink and brown. 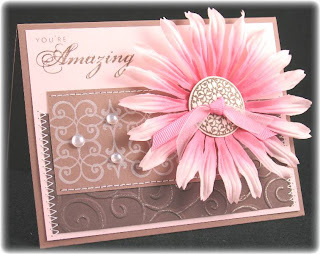 I used one of my new Verve sets, Artful Elegance, for the flower center and the smaller brown strip, and then I embossed the bigger brown piece with the D'Vine Swirls embossing folder. I traced over the embossed Swirls with a clear glitter pen and also drew in some lines on the Prima flower for just a bit of sparkle. The finishing touches are the sentiment from the Thankful Blossoms set and the pearl Dew Drops. Today's card was made using the Meet the Verve Divas Part 7 sketch. 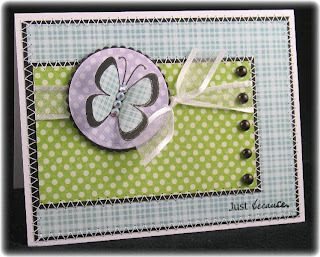 I used the Fluttering By set and all the patterned papers are from the Nana's Nursery Baby Boy paper pad. I know you're probably getting sick of this paper by now, but I just love it and I got the 12x12 pad, so I've got a ton of it! Other materials used: ink - Graphite Black Brilliance (Tsukineko); circle and petite scallop circle Nestabilities; Dew Drops; black cardstock (Stampin' Up! ); ribbon (local craft store); Black Spica glitter pen; AB rhinestones. Today is the 20th of the month so that means Celebrate MFT Day! 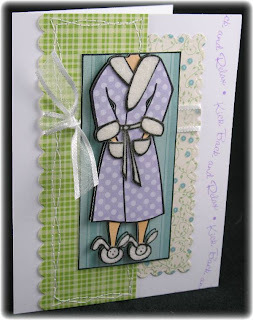 Today's card was made using the Bunny Slippers set. This card actually took me a really LONG time because of all the flocking. I don't like to just put glue in an area and fill with flocking because sometimes it obscures the stamp lines, and often it doesn't give enough coverage. My method of flocking goes like this: (1) cover piece of cardstock of preferred color (in this case I used white) with red liner tape sheet on one side; (2) expose adhesive and apply flocking, taking care to really rub the flocking into the adhesive and rub off all the excess; (3) stamp image onto flocked sheet and let dry; (4) cut out image. 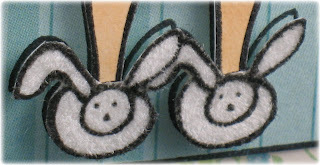 Here are a couple close-up shots so you can see how nicely the flocking comes out this way. If you are familiar with the velveteen paper that Stampin' Up! used to sell, it's a lot like using that. I'll admit it's a lot more work, but it's so worth it! Other materials used: patterned paper - Nana's Nursery Baby Boy (DCWV); white cardstock (Papertrey Ink); inks - Graphite Black Brilliance (Tsukineko); Lavender Lace (Stampin' Up! ); satin edged organdy ribbon (May Arts); white flock (unknown); Long Scalloped Rectangle Nestabilities. I really liked the Sheetload Mini sketch this month (especially since it's a regular sized card) so I decided to give it a try. I gave it a little twist - instead of including 1 small image on each patterned paper panel, I used the branch across all 3 panels, and then centered the owl. The branch and saying are both from The Landing Pad set and the owl is from the U R A Hoot set, both of which are from Cornish Heritage Farms. 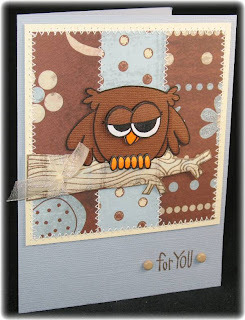 I stamped the owl twice on brown Bazzill cardstock, and once on Georgia Pacific white cardstock. I colored the beak and toes with Copics on the white version and cut out the eyes with the beak, and also the toes. Then I cut out 1 full brown owl, and just the eyelids of the other brown owl. I did just a bit of shading on the full brown owl and then glued the eyelids onto the eyes. The full eyes and toes were then stuck on with foam dots. Last notes: the branch was stamped on patterned paper, cut out, and popped up, and I did a bunch of zig zag stitching all around the PP pieces. I really like how this card came out and may be using the sketch again in the future! Other materials used: ink - Graphite Black Brilliance and Papertrey Ink Dark Chocolate; patterned paper - Dream Street Papers LLC (Near & Dear line); all cardstock - Bazzill; ribbon - Stampin' Up! ; brads - unknown. Since MFT is the sponsor for the August Sheetload, I decided to use one of my new sets, Totally Witchin', for this Sheetload. The funny thing is that I pretty much never send out Halloween cards (because I can never be sure if someone will be offended to receive one), but I just LOVE Halloween stamps! So, these will go into my stash until I figure out what to do with them all! I stamped all the jars onto white cardstock and colored with my Copics. I tried to get them to look like the stuff they're actually supposed to be (although the eyes were really difficult to recreate without being too creepy). Check out the close-up picture below and let me know what you think! The black panel is embossed with the Cuttlebug D'Vine Swirls folder and the small purple squares are embossed with the Swiss Dot. There are little black half-beads in the center of each flower and those bits around the flowers are google eyes! I thought they would be a fun accent, especially since they're clustered around the jar of Eye of Newt. Hope you like my Sheetload! Thanks for visiting! The August issue is sponsored by one of my fave stamp companies: My Favorite Things! And the sketch is fun and really versatile! I had a blast making my sheetload this month and will have it posted very soon! 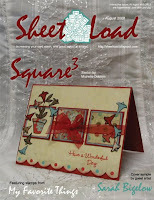 And while you're at it, check out the August Mini Sheetload as well! I realized yesterday while finishing up my Anni-VERVE-sary challenges that I was doing mostly "scrappy" cards with almost no stamping and no coloring! I can't remember the last time I actually used my Copics!! This card is more of the same using Sketch #7. Since I didn't want to just keep using the same images over and over again, I decided to do a few of the sketches with the focus on the sentiments. 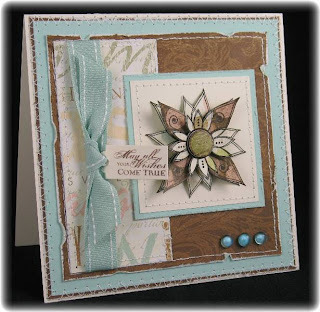 I thought this one went perfectly with this Daisy Bucket Designs paper from their Love You line. 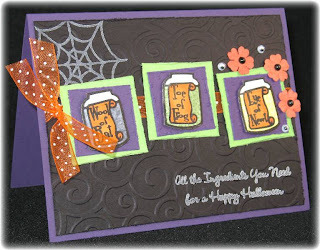 Other materials used: Thankful Blossoms - Verve Stamps; Ruby Red cardstock and ink - Stampin' Up! ; ribbon - May Arts. Another Anni-VERVE-sary sketch card, this time for Sketch #9. Materials used: Thankful Blossoms and Wonderful Wishes Remixed stamp sets from Verve Stamps; Studio K patterned paper from K & Co.; Aqua Mist cardstock and ribbon and Dark Chocolate ink from Papertrey Ink; faux drops from Michael's. I'm still working on all the Anni-VERVE-sary sketches, but I thought my few Verve sets were being overused so I went with some MFT stamps for this one. Also, I wanted to play in the MFT Ambassodor Challenge #2 this month which was to do stitching on a card (and you all know how much I LOVE sewing on my cards!). As you can see, I turned the sketch on its side because I wanted to use these bunny slippers as my focal image. 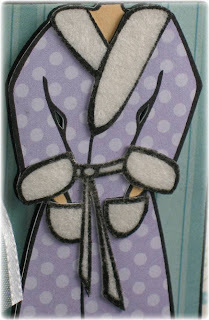 I hope you like my use of the slippers from the Bunny Slippers set for a baby card instead of a get well card! Other materials used: sentiment - My Favorite Things ( What's Up Cupcake set); patterned paper - DCWV Nana's Nursery Baby Girl paper pad; Graphite Black Brilliance ink; Papertrey Ink Berry Sorbet ribbon and cardstock; Copic marker (shadowing on slippers); circle and petite scalloped circle Nestabilities. I'm really trying to do all 12 of the Anni-VERVE-sary sketch challenges, so you'll be seeing a LOT of these Verve sketch cards for the next week!! Also, the Meet the Verve Divas Part 4 challenge was to make a tall skinny card (longer than 5.5"), so this fits that challenge also since my card is 6.25" tall! All the patterned paper is from the DCWV Nana's Nursery Baby Boy 12x12 paper pad (I love this one just as much as the Baby Girl version!!). The striped sheet actually has a lot of glitter embedded in it and is super pretty in person - I just wish I could capture it better on film! 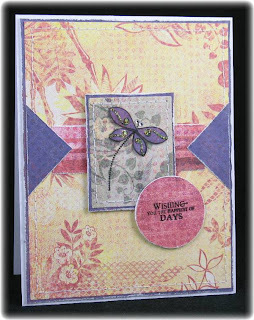 Other materials used: Thankful Blossoms and Wonderful Wishes Remixed stamp sets - Verve Stamps; Apricot Appeal cardstock, Only Orange and Mellow Moss ink - Stampin' Up! ; May Arts ribbon; 1/16th" hole punch. Today's card was created for the Anni-VERVE-sary Sketch #4. I copied the sketch exactly and had a lot of fun with it - Julee's sketches are always really cool and original!! 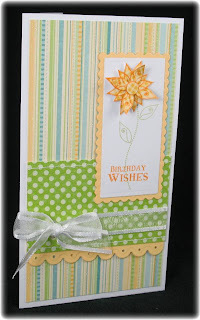 I used 2 different Verve sets - Thankful Blossoms and Wonderful Wishes Remixed. I've only got a few Verve sets so you'll be seeing me use the same images a lot during this challenge series. 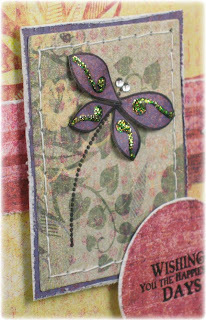 Hopefully I'll find some original ways to use the stamps, like today's dragonfly. So my idea (hopefully I'm the first one to think of it!) was to make a dragonfly from the stem and leaves in the Blossoms set and I really like how it turned out! You can see the dragonfly a little better in this close-up shot. I stamped the small and large leaves 2 times each onto the purple paper then cut them out. I stamped the dotted stem (only partially inked because it was too long for my dragonfly) on the green paper then glued the bitty rhinestones and leaves over it. Lastly, I applied some green stickles over the lines on the leaves for a little sparkle (you can see that way better if you click to enlarge). I hope you like my idea and my card! Thanks for another great sketch Julee! Other materials used: white cardstock - Georgia Pacific; patterned paper - Basic Grey (Lucky line); Graphite Black Brilliance ink; Nestabilities.